In a large separate bowl, beat butter until very fluffy (approx. 5 minuets) then add 2 cups of sugar. Continue to beat until light and fluffy (approx. 2 more minutes). Mix in sour cream and vanilla extract. Blend in some of the dry ingredients followed by some of the buttermilk in alternates. This is a way to ensure that the ingredients are being thoroughly blended together -- For example; add dry mixture followed by buttermilk, dry mixture, buttermilk dry mixture -- so on and so forth -- DO NOT OVER BEAT OTHERWISE CAKE WILL BECOME HARD AS A BRICK ONCE FINISHED BAKING! Grease a bundt cake pan. I used a non stick angle food spring formed tube pan. If you do not have a non stick pan, be sure to grease your pan and dust with flour! Add in 1/4 cup of sugar to the bottom of pan and about 3 inches up the sides, tapping the pan to ensure even distribution. Leave excess sugar in pan. Sprinkle coconut flakes to the bottom of the pan. Scrape batter into the bundt pan and spread evenly. Bake for about 50 minutes to an hour or until a wooden skewer inserted comes out clean (if it comes out wet, bake another 10 minutes or so, if it comes out crumbly, you over baked the cake). Drizzle glaze over the crunchy top portion of cake. 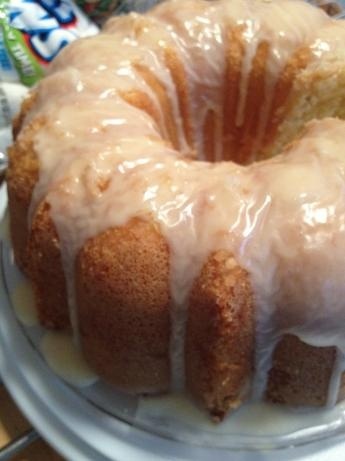 Please use my Vanilla Almond Glaze recipe to complete this cake!